Cook and hold delicate foods like rich Hollandaise sauce, creamy custard, and other complex creations with the Browne BMP1 bain marie pot. The stainless steel construction makes the pan durable and resistant to corrosion. With a satin finish interior and mirror-polished exterior, the pan has a classy appearance. This bain marie pot fits a 4.1-inch-diameter opening and allows kitchen staff members to carry their culinary creations from the kitchen directly to the serving line. The Browne BMP1 bain marie pot is great for storing foods, in addition to creating a hot water bath for cooking delicate foods. 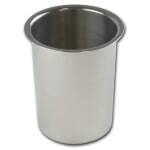 To prevent contaminants from getting in food, pair this pot with the Browne CBMP1 bain marie pot cover. Fits an opening of 4.1 in.